In a world dominated by emotion, passion and fervour, human expression is the sole attribute that differentiates us from our fellow creatures and makes us who we are. And human expression can only be made significant by the facial features that we possess. These are what help express our everyday emotions, everything from simple astonishment to anger and fury, in a language that goes far beyond mere talking. Expression dominates our lives to such a level that we even have an entire section of art dedicated to just that- 'mime'. However, it is in no way confined to the stage because human expression is very much a part of our day to day lives. It is what enables us to be understood by any fellow human being without the need to even utter a single syllable. And undoubtedly, the single most important component among all our facial features, that dominates all else, is the eyebrows. Consider Elizabeth Taylor's winged beauties, which remain unforgettable even today. Or Brooke Shields' full and natural look. Indeed, the brow has a totally different language of its own! A simple arch can convey anything from an invitation full of promise to a barely veiled moment of irritation. From furrowed and arched eyebrows representing anger, tension and curiosity, to raised ones, showing astonishment or scepticism, the brows say it all! Not just in expression, eyebrows are also a very important part of our facial beauty. So much so that women, and even some conscious men today, dedicate a portion of their precious time to taking care of and maintaining that part of our facial features that enhance elegance and sophistication. Not to mention neatness, because a clean and shaped pair of eyebrows can really do wonders to our overall appearance! They frame the face, bringing focus to the eye and provide balance. Good brow shapes can lift the entire eye area and make you seem so much more awake, youthful and "together". When all said and done, lets take a look at the latest trends and styles in the world of brows. First, there's the 'Not so big, big brow'. This is the perfect choice for the girl who is growing out, or simply wants an easy-care brow shape. Weight around the inside of the eye with a slant edged arch means that this look will open the eye despite the heavier line. Then there is 'the soft dark brow'. A full brow often can look too harsh on the face, which is why so many people avoid them in the beginning. On the contrary, a large brow can actually be very soft. Lifting the brow so it's higher off the nose means opening the eye entirely. The semi-dark colour means they are dark enough for impact but not too over-bearing. Nothing of course, beats the all time favourite- 'the natural look'. Those who don't want to experiment much can stick to this type of look where the natural weight is simply lightened around the very inner and very outer edge of the brow. The shape is “tidied” yet not very much weight of the actual brow is removed. This is a great move for those who have heavier features or wide faces as it can create great balance. And finally, a look that is very much in style now- 'the tamed look'. 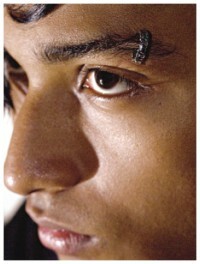 The weight of the brow is kept, yet here the shape is also played with, with emphasis on length as well as the brow volume. The clean lines are probably one of the key features of the look, which will be achieved with vigilant plucking or waxing. Having said and done on the trends and styles of eyebrows, we might as well now get down to the real nitty-gritty of the stuff- on how to maintain and take care of the brows. The road to beauty, or any form of accomplishment, for that matter, is never an easy one and obtaining a glamorous look does not come without its fair share of pains. While beauty treatments such as facials, massages, manicures and pedicures are very relaxing and are pleasurable ways to pamper yourself, things like waxing and eyebrow plucking, lets face it, are not exactly what we often look forward to. Never the less, we can't really do without it either because it is however, one of the most basic and crucial stages of grooming. So here are a few tips on how you can take care of your eyebrows and on how to obtain that most desirable look. Maintenance is necessary on a weekly or bi-weekly basis to keep them looking their best. If the hairs are excessively long, it is perfectly okay to trim them with manicure scissors. Trimming them can make a big difference. Actually it is a good idea to trim before you pluck. The best time to pluck your eyebrows is after you get out of the shower. The pores are still open and it doesn't sting quite as much. Be careful not to pluck so that holes appear in your brows. Take a good look at the root area of the hair before you yank. One of the most important things to be kept in mind regarding the eyebrows is that if you have small delicate features, your brow should be delicate as well but if you have an athletic build, delicate brows will look silly. They will look more natural if they are a little thicker and less manicured. If you have small eyes, a well-shaped brow is something that you should strive for. It will help to make a statement without a lot of extra colour around the eyes that can make them look even smaller. The biggest mistake people make is to tweeze too much. Avoid over plucking as it can take months for brows to grow back. Here's a simple trick to remember: The space between your brows should be equal to, or a little wider than, your eyes. To find where your brow should go, take a long eye shadow brush or pencil and hold it parallel to the side of your nose. Where the brush meets your brow is where your brow should begin. To find the end of your brow, extend the brush diagonally from your nostril, following the outside edge of your eye toward the brow. Where the inside edge of the brush hits is where your brow should end. The best brows have a slight arch. To find yours, hold the brush parallel to the outside edge of the coloured part of your eye (the iris). Where the brush meets the brow is where the highest part of your brow should be. Cleanse your skin. Exfoliating with a gentle scrub helps prep the area as well. Worried about pain? Expert aestheticians suggest applying to the brow Anbesol, Orajel or any teething gel for babies. Brush brows up and out. Plus, a good pair of tweezers is always a great investment. You also want to make sure you're near a window with light pouring in or under a bright light with a good mirror. Make sure to pluck hairs in the direction they grow. Don't grab too many hairs at a time. Stop every few hairs to step back and look at the job you're doing. If you over pluck, you're stuck. Unlike most hairs on your body, your brows won't always grow back once they're yanked. Once you're done plucking, you can apply aloe vera gel, which will calm the redness right away. Apart from all the above, here are a few other tips on how to maintain your eyebrows as well the instruments you use to shape them with. To ensure your tweezers maintain their firm grip, regularly wipe the tips with alcohol to remove any oily build up. If your brows are sparse or spotty, you can fill them in by pressing a brown shadow into your brow. If you use a pencil to fill in sparse brows, apply with short, feathered strokes from the inside of the brow out. Then carefully rub brows with a brush or your fingertips to soften the effect. So, having all said and done, one can see that caring for the brows is really quite simple, as long as you make some time out of your schedule for it, because a well kept pair of eyebrows can do wonders for your over all appearance.